It had been a splendid day of family time spent in Coeur D’alene, Idaho, but it was time to leave. Just as well, I figured, as the wind kicked up and the previously blue sky began to cloud up dramatically. We hit the road for the two-hour drive home as raindrops began to dot the windshield of our bright red Oldsmobile. Lesson #1: Regularly check your tires. Partway through our drive, we began to hear an odd, rhythmic flapping sound coming from the back of the car. We ignored it for a while. In that region, it could have just been a runaway tumbleweed stuck under the vehicle, right? But no… Tumbleweeds sound much rougher than that (believe me, it’s an alarming sound! You wanna frighten your friends? Stick a tumbleweed under their car before they drive off). Turns out, one of our tires had decided to come apart at the seams and was flapping it’s tread up and down as if in protest of our travels. Lesson #2: Check your spare tire, too! We thought it would be a simple matter of putting on the spare tire. We thought wrong. Our spare was completely flat and unusable. We were left with one option: call for a tow truck. My mom, dad, brother, and I waited and watched as the daylight desolved and gave way to an increasingly active lightning storm. Still no tow truck. We continued to wait- what else could we do? An hour or so later, our escape vehicle finally arrived. We gave a cheer, then wondered if our joy had been premature after seeing who got out of the truck. The men were tall, creepy, looked like they hadn't bathed in weeks and smelled as if that were the truth. Lesson #3: Never hesitate to speak up. One of them gave the car a precursory check, lighting his cigarette as he crawled underneath the chassis. We grew ever more uneasy. As they began to hook the car up to their tow rig, they informed my mother that, “There isn't room for your whole family in the cab. Your husband can duck down and ride in the back of the car as we tow it. You and your son can have the seats, and your daughter can ride on his lap.” The man gestured toward his cohort. My mom quickly came to the rescue: “My daughter will not ride in anyone’s lap! She will ride in the back of the Oldsmobile with her father.” The man nodded and shrugged, “Suit yourself.” Dad and I climbed into the back of the car. “Just keep your heads down,” said the tow truck driver, “It’s actually illegal to be doing this.” Dad laid down the driver’s seat and I settled into the back, enjoying the chance to put up my feet and watch the lightning. Lesson #4: You can’t always judge by appearances. My mom and brother had a very different experience. Upon getting into the cab of the tow truck, they were immediately greeted by the intense smell of cigarette smoke. As they buckled up in the dark, mom felt a tin can crunch under her feet. “Please don’t let that be beer.” She silently prayed. All we needed was to be riding with men who were both creepy AND drunk. Eventually, mom was relieved to discover that the can was Pepsi rather than beer, and that despite being smelly and creepy looking, the men were polite enough. Lesson #5: Everything happens for a reason. 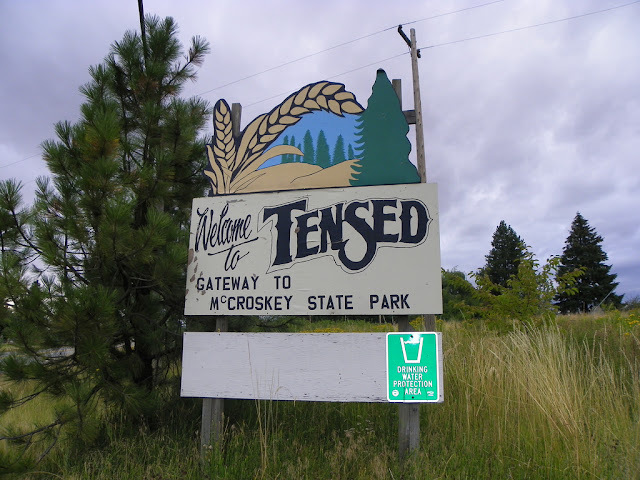 After about 45 minutes of driving, we finally arrived in Tensed, Idaho, and pulled into their lone fuel station. The tow truck drivers got the owner out of bed to turn on the air pump so that we could fix our flat. As we were doing so, a large van with two adults and a number of children rolled into the parking area on their last fumes of gasoline. The pumps were closed, but the owner took pity on everyone and got them all fueled up. Were it not for us getting him out of bed to fill our tire, that family likely would have spent a long night on the roadside somewhere. So, there you have it. My favorite family vacation story. Lesson #6: Mishaps can be cause for the best adventures! even when things occasionally go awry!